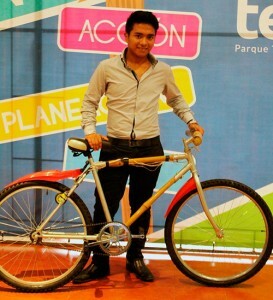 Bambootec, a consortium from Yucatán, Mexico, has designed a bamboo bicycle that turns pedaling into electricity for charging mobile devices. With a navigation dashboard in the handlebars, this unique bike measures distance and time thanks to a bluetooth connection. After all, Bambootec’s creation it’s an impressive piece of engineering—particularly if the designs are simple enough to be built by hand by individuals in areas where rolling blackouts are a part of daily life. Cristina Espinosa López, founder of Bambootec, said to inhabitat.com that the energy transfer is made possible thanks to a converter made of a circuit starting on the rim and proceeding through the system core under the seat, which captures and converts the kinetic energy into electricity. A regulator was also added to the converter, in order to assure that the electricity generated by the bike isn’t unevenly distributed due to variations in speed or quick braking. The frame itself is assembled with bamboo sticks and resin, instead of metal, making the bike sturdier, lighter and more resistant to heat. In all, the device sounds like an excellent instance of appropriate technology. The bikes could easily be assembled in the developing world since bamboo is cheap, though certainly not the cheapest material in the world. And the bike could be used both for transport and for charging devices when faulty power grids go out, which can be an hourly occurrence in many parts of the world. Electricity-generating bikes are certainly nothing new, but used it that context, this one could do the world some good.